Following is a script that describes the process and provides instructions for applying and obtaining both new and renewed Notary Public commissions (appointments). Fees are payable by Cash, Money Order, or Certified Check, unless otherwise indicated. *Under normal operating conditions, the State sends out a renewal package three months prior to the commission expiration date. If renewal packages are not received in this time frame, applicants are responsible for requesting packages via one of the alternatives listed above. Complete the application form in strict accordance with the instructions listed on the form. As part of completing the form, obtain endorsement of a member of the Legislature. Non-resident applicants must also file an affidavit with the Treasurer setting forth their residence and address of the office or place of employment in New Jersey. The affidavit should be submitted with the application form to the Notary Section. Review the application form for completeness and fee. Accept it and return a Notary Public Commission Certificate and Oath Qualification Certificate to the applicant; or rejects it and returns the form with rejection notice to applicant for correction and resubmission. Take the Commission Certificate and Oath Qualification Certificate to the Office of the Clerk within three (3) months from the date the commission is received. **Remember that failure to meet the 3-month time limit will result in the cancellation of the appointment, and the filing fee will be non-refundable. Administers an oath to the applicant. Appear during regular operating hours to be sworn in. Collects a $15.00 filing fee per the Clerk’s statutory fee schedule. Returns the Qualification Certificate to the Notary Section, thereby completing the application process. 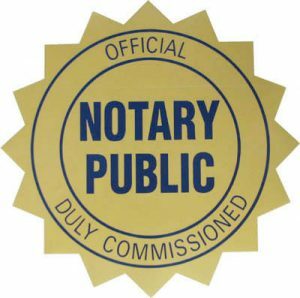 **The Notary Public Section maintains a computer database of all Notary commissions, and will enter the “sworn date” from the Qualification Certificate to ensure that the public record reflects the official date of the Notary’s appointment.